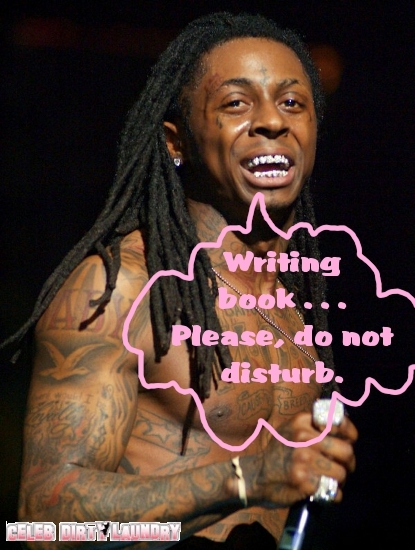 Lil’ Wayne is yet another celebrity who thinks he has what it takes to write a book about his life. The twenty-nine year old rapper kept a detailed diary of his life behind bars, which will serve as the primary meat of his forthcoming memoir, tentatively titled Gone Till November. In 2010, the rapper found himself being charged with gun related charges; the conviction eventually landed him in the infamous Riker’s Island Prison located in New York. And, apparently (or hopefully), some exciting things occurred inside the place for him to be publishing a personal narrative on the subject. It’ll be interesting to see how successful this particular celeb memoir is, which is scheduled to be released on November 28th. As of yet, there’s no word on how far along the rapper is on the manuscript, but with a release date that soon (pretty soon for publishing standards), we hope he’s truckin’ along. It’s no surprise that books written, whether fictional or non-fictional, by celebs do well. There definitely is a market for them. While I can’t say that I’ll be pre-ordering a copy (or even reading it for that matter), I’m almost positive his story will reach more than a few eyeballs. What about you? Do you have any interest in checking out Lil Wayne’s personal story?